Olly the Jack Russell terrier. 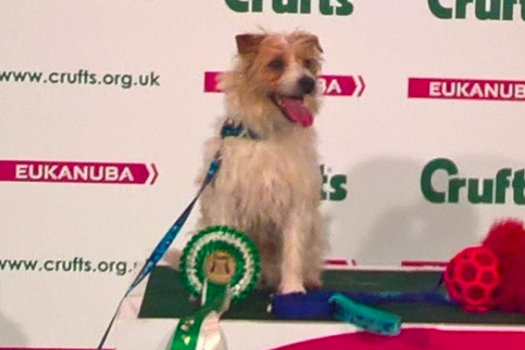 It was the sort of blooper reel every dog owner lives for, only in this case it happened at the 2017 Crufts dog show in England and wound up plastered all over the internet. The world's largest dog show, held annually in Birmingham, features an event for the benefit of rescue dogs who are not exactly trained for the bright lights. But the great thing about being a dog is that you don't care what people think about you, especially not when you have the chance to run wild on an obstacle course. That brings us to Olly, a Jack Russell terrier "competing" in the Rescue Dog Agility event, which tests very precise movements and general grace in navigating the course. Olly got off to a really rough start, as seen below, and now the internet is obsessed with him. The rest of his run is an admirable display of boundless energy, momentary confusion and true happiness. With his newfound fame, Ollie has made his way to Twitter and Instagram. It was a little too soon for Facebook.